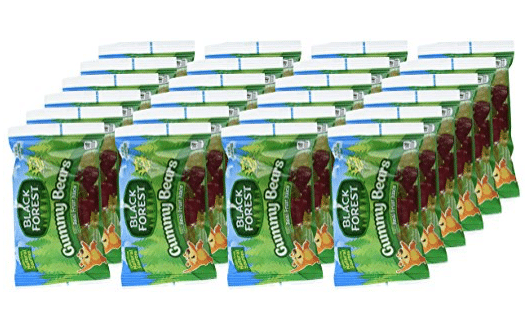 Amazon has a big price cut on Black Forest gummy bears! Get 24 packs of these natural gummy bears (with no petroleum based food dyes) for just $7.59 when you choose Subscribe and Save for 5% off! That makes each 1.5 oz. bag just $.32! Or, if you have 5+ S&S items in a month, you’ll save 15% off when choose Subscribe and Save, bringing the price down further to $6.79, so $.29 a bag! I like having natural candy on hand for birthday parties or other events where candy is given out. That way my kids can still enjoy a treat without the nasty chemicals, hfcs and food dyes. We love these! We always purchase the organic candies or Annie’s Fruit Snack deals to use for the classroom parties or Girl Scout events. They’re also great to save for birthday parties or special rewards. We have a local restaurant who gives out artificial color dummies and I keep organic lollipops or other organic candies on hand to replace the chemical laden junk. Thank you for sharing!